1) This paper has been prepared to the FIG Working Week / GSDI-8 Conference in Cairo, Egypt, April 16, 2005 and is based on the Special Forum held at the INEGI headquarters in Aguascalientes on 26 and 27 October 2004 with a theme of “The Development of Land Information Policies in the Americas”. There are difficulties being faced by many United Nations member States in designing appropriate spatial data infrastructures to support effective land administration, and in integrating cadastral and topographic spatial data, especially in digital form. Therefore, there is a need to improve capacity to design, build and manage land administration systems, which incorporate appropriate spatial data infrastructures. In many cases there is a lack of understanding of the important role spatial information (i.e. information that provides location on the earth, e.g. to allow accurately plotting on maps) plays in land administration projects, particularly in developing countries. In many countries the land ownership and registration function is located in one department e.g. the justice or legal department of government, while the geodetic survey and mapping function is located in another department, and often has very little if anything to do with the ownership and registration function. When a land administration project is initiated and funded, say by the World Bank, the government’s institutional arrangements of departments can make it very difficult to access information and involve the skills and knowledge between different departments, e.g. between the survey and mapping functional area and justice and legal functional area. 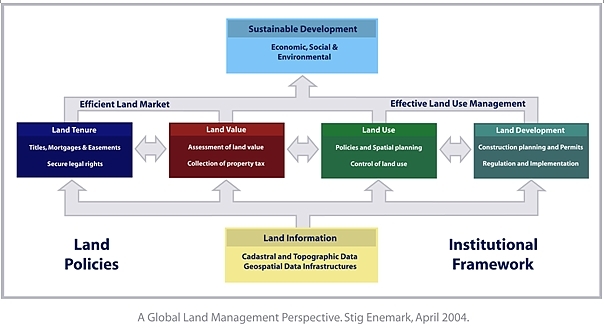 To establish an awareness of the economic and social value for decision makers, of the importance of developing land policies that effectively and efficiently incorporate appropriate spatial data infrastructures (SDI´s). To develop an overall understanding of the economic and social that results from integrating the land administration/cadastre/land registration functions with the topographic mapping function. The UN, FIG, PC IDEA Inter-Regional Special Forum on “Development of Land Information Policies in the Americas” was based on a resolution adopted at the Seventh United Nations Regional Cartographic Conference for the Americas held New York January 2001. The International Federation of Surveyors (FIG) was tasked with taking the lead role in organizing the special forum with support from the United Nations Statistics Division, Department of Economic and Social Affairs, and the Permanent Committee on Spatial Data Infrastructures for the Americas (PC IDEA) and was hosted by the National Institute of Statistics, Geography and Informatics (INEGI) in Aguascalientes, Mexico. Invitations were issued by the United Nations to Ministers of Government who have responsibility for the above functions, or their senior managers who have a policy responsibility, to attend. There were about 60 delegates from 18 countries together with representatives from the United Nations, PC IDEA, World Bank, and the Pan American Institute of Geography and History (PAIGH). The initial issue was funding, which took some time to resolve. It is therefore gratefully acknowledged the support and funding provided by the Canadian Government through Natural Resources Canada, the United States of America Government through USGS/FGDC and USAID, the World Bank through the Danish Trust Fund, and PAIGH. The program of the special forum consisted of four key-note presentations followed by some case studies from various regions of the world, and a number of case studies from the Latin American countries. The case studies followed a common format in order to ensure consistency and contextual focus. All papers were prepared by personal invitation in order to ensure consistency with the special forum profile. Sessions were allocated to discussions of the case studies and for short presentations and discussions on the challenges facing the Americas with respect to the theme of this forum. These provided the opportunity for those attending to either comment on a presentation or provide some insight into the situation within their own country. The full papers and the ppt-presentations are available in English and Spanish at the FIG website on http://www.FIG.net/pub/mexico. Foster modern land policies and associated spatial data infrastructures so as to better support social, economic and environmental sustainability. Determine policies and programs for educational, professional, and institutional capacity building that will ensure the development of appropriate land administration systems and associated spatial data infrastructure. Develop appropriate institutional, legal and technical processes to integrate land administration, cadastre and land registration functions with topographic mapping programs within the context of a wider national strategy for spatial data infrastructure (SDI). Land Management is a very complex and interdisciplinary concept that includes a mix of technical, natural, and social sciences. Land management can be described as the processes by which the resources of land are put into good effect. It is about land policies, land rights, property economics, land-use control, regulation, implementation, and development. Land management encompasses all those activities associated with the management of land as an asset and a resource to achieve sustainable development. Within the country context, the land management activities may be described by the three components: Land Policies, Land Information Infrastructures, and Land Administration Functions in support of Sustainable Development. A modern land administration system acts within the environment of adopted land policies that fulfill political objectives with regard to land issues. It also acts within an institutional framework that imposes mandates and responsibilities on the various agencies and organizations. Basically such systems are embedded in the historical, cultural and judicial setting of the individual country. However, in spite of the different origins the systems seem to merge into a global model serving some basic societal needs. Such a global model is shown in the diagram below. The operational component of the land management paradigm is the range of land administration functions that ensure proper management of rights, restrictions and responsibilities in relation to property, land and natural resources. These functions include the areas of land tenure (securing and transferring rights in land); land value (valuation and taxation of land and properties); land-use (planning and control of the use of land and natural resources); and land development (utilities, infrastructure, construction planning, permits, and implementation). The land administration functions are based on and are facilitated by appropriate land information infrastructures that include cadastral and topographic datasets and provide access to complete and up-to-date information of the built and natural environment. The information on land and properties permeates through the overall system and provides the basic infrastructure for running the administrative systems within the four interrelated areas. The land information area should be organized to combine the cadastral and topographic data and thereby linking the built environment (including the legal land rights) with the natural environment (including environmental and natural resource issues). Land information should be organized as a spatial data infrastructure at national, regional and local level based on relevant policies for data sharing, cost recovery, access to data, standards, etc. It is generally recognized that about 70 per cent of all government information is geospatially based. Sound land management is the operational processes of implementing land policies in a comprehensive and sustainable way. In many countries, however, there is a tendency to separate land tenure rights from land-use rights. There is no effective institutional mechanism for linking planning and land-use controls with land values and the operation of the land market. The problems are often compounded by poor administrative and management procedures that fail to deliver the services that are needed. Investment in new technology will only go a small way towards solving a much deeper problem, which is the failure to treat land and its resources as a coherent whole. Good land management will help promote economic and social development in both urban and rural areas. For developing and transition countries, land reform policies are key components in achieving these goals. The challenges in this regard relate to educational, professional, and institutional issues. With few University programs in Land Management, the Latin American and Caribbean region is lacking experts to support systems of sustainable land administration infrastructures. There is a need to develop comprehensive University programs with a broader profile than a technical focus. And there is need to share efforts and information between educational institutions in order to serve the basic land administration needs in the region. Donors such as the World Bank and other aid agencies where they are building land administration systems should include the educational component to ensure long term sustainability. In many Latin American and Caribbean countries there is a need to establish professional associations that can set standards, enforce professional development, and interact with sister associations within the region and world wide through international NGO´s such as FIG. This will increase awareness about regional and global opportunities for technological development and transfer, institutional strengthening, and the exchange of managerial and SDI experiences. With regard to institutional arrangements it is understood that one model will not fit all countries. In spite of sharing much the same geography and history, the Latin American and Caribbean region shows diverse approaches to land information and land registration systems, as well as to the building of spatial data infrastructures. Such systems are embedded in the institutional development of the country or jurisdiction and the institutional arrangements may change over time to better support the implementation of land policies and good governance. In terms of capacity building attention should be given to sustaining existing educational facilities in terms of institutional development, quality management, and financial support. Attention should also be given to the development of one or more Regional Centers in the Latin American and Caribbean region for Education and Research in Land Administration. Such centers should act as ongoing bodies of knowledge and experience in land administration and using actual projects as long-term case studies and operational laboratories. The centers should provide educational programs and supervise establishment of educational programs at other institutions. The centers should develop guidelines for capacity assessment in land administration and interact with national institutions, international academics and professional bodies to assist regional and local development serving regional and local needs. It is important that the countries in the region develop a wider vision for the creation of knowledge, reduction of poverty, and sustainability. In this regard, it is time to handle change and to convince politicians and decision-makers. The need to formulate national policies, legal frameworks, and standards for land administration, land information and spatial data infrastructure is widely acknowledged. Visionary leadership and also short term initiatives such as shared data collection projects are recognized as important to establish inter-organizational and inter-regional cooperation. It is necessary to ensure coordination between the key players, and to break down human, technical and political barriers. It is important to have a focus on the users needs in order to build trust amongst the beneficiaries of the systems. Credibility and transparency must be built into the processes, including institutional continuity and continuous modernization. The need for capacity development of human resources through the building of programs for education and training in land administration must be reinforced. This also applies to the establishment of national professional bodies to interact at regional and global level. There is a need to integrate land administration, cadastre and land registration functions with topographic mapping programs within the context of a wider national strategy for spatial data infrastructures. The conclusions can be summarized in the “Aguascalientes Statement” as presented earlier in this paper. The Special Forum recommends that politicians and decision makers at various levels take note of this statement and make efforts to ensure its implementation. Information and references on the Special Forum can be accessed through the FIG web site at http://www.fig.net/pub/mexico/index.htm. The Aguascalientes Statement is also available through the FIG website at the address http://www.fig.net/pub/figpub/pubindex.htm. Stig Enemark is Head of the School of Surveying and Planning at Aalborg University, Denmark, where he is Professor in Problem Based Learning and Land Management. He is Master of Science in Surveying, Planning and Land Management (1966) and he worked for ten years as a consultant surveyor in private practice. He is currently the President of the Danish Association of Chartered Surveyors. He was Chairman of Commission 2 (Professional Education) of the International Federation of Surveyors (FIG) 1994-98. He is an Honorary Member of FIG and he is Vice-President of FIG 2005-2008. His teaching and research are concerned with land administration systems, land management and spatial planning, and related educational and capacity building activities. He has undertaken consultancies for the World Bank and the European Union especially in Eastern Europe and Sub Saharan Africa. He has more than 200 publications to his credit, and he has presented invited papers to more than 50 international conferences. John Parker is an international land administration consultant specializing in quality management, professional practice and management and geographical names. He was Surveyor General of Victoria, Australia for nine years and had spent nineteen years in private practice in a multi disciplinary firm. Currently he is actively involved in the International Federation of Surveyors and was chair of FIG Commission 1 (Professional Standards and Practice) 1998-2002. Membership of professional associations includes the Institution of Surveyors Australia and Spatial Sciences Institute. Papers have been presented and published at a range of events, including international forums, on a wide range of subjects.